Free knitting pattern to download: just click on the link above to get your pattern straight away! 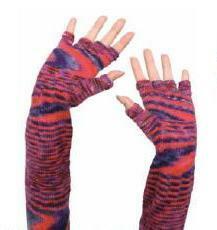 Ladies' stocking stitch fingerless gloves with thumb gusset and individual fingers. 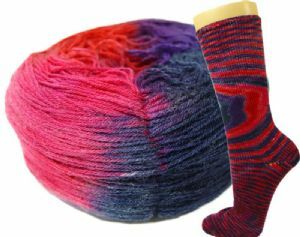 These wrist warmers are perfect for showing off the zany self-patterning FLYING SAUCERS sock yarn, which gives you intergalactic wave effects!